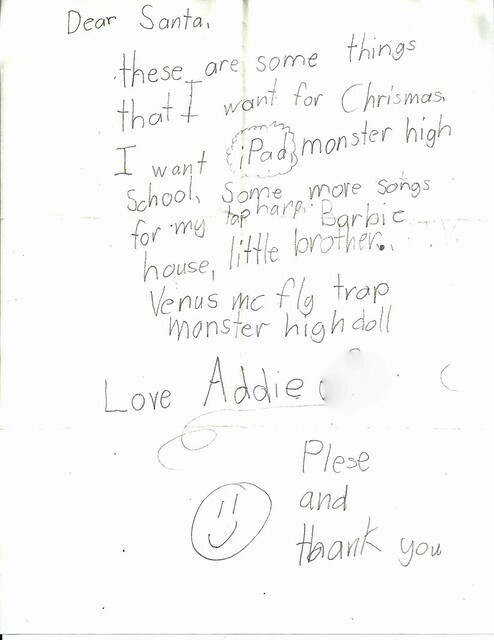 Addie hasn’t had the same vim and vigor for Santa and Christmas this year. I started to suspect that someone at school told her that Santa was all a lie (I even know which little kid to blame) and Addie being Addie was crushed by the news yet locked up deep in her heart was the hope that Santa wasn’t a lie and her friend just had horrible parents. I voiced my suspicions to Cody who just brushed them off as “She can’t believe in Santa forever.” and his little sister who agreed to help me feel Addie out with where she stood on this whole Santa business. Early Sunday morning Addie decided she was going to write a letter to Santa. She locked herself in her room with a pencil, a piece of paper and an envelope. When she came out she read the letter to Angee then to me before shoving it in the envelope, addressing it to ‘The North Pole’ and putting it in the mailbox. She was sure I never actually read her letter and I never asked to see it, which was part of my plan. I wasn’t sure what to expect when I opened her letter later the next day over lunch, maybe it really would be exactly what she read out loud to me, but my maternal instincts knew there was more to the story. Sure enough I was right. This left me with two choices. A) Give up the gig that Santa isn’t real or B) Get equally creative. I chose B. Because obviously. Rather than an iPad (honey, mama doesn’t even have an iPad) Addie will be getting a very fancy hand written letter from Santa that apologizes for not getting her the iPad and explaining that her grandpa and grandma are actually two of his helpers when he and the elves are super busy which is why she’s getting a handmade (by my dad) doll bed and doll quilt (made by Grandma) for Christmas this year. TAKE THAT COMMERCIALISM! She won’t believe in Santa forever, and that’s okay. But she can believe in magic forever. Hopefully this year she’ll be able to see some of the magic shift from reindeer and elves to her very own grandparents who will work so hard to make her Christmas special. She’ll be able to wake up in the home I woke up in as a child on Christmas morning, see, smell and experience what I did on Christmas morning when I was her age. I knew Santa wasn’t real when I was eight, but from the feeling of love, the warmth of the fire and the happiness I felt from being together with my family on Christmas morning? I love this post! I can really relate to your comment on what happiness is to you. And how did you take that amazing picture of Addie? My daughter is 10 and this is the first year she doesn’t believe. But, when we talked about it, I told her that even though I was 38 years old I still believe in Santa. Sometimes Santa is a feeling more than a Jolly Old Elf. My daughter is 8 and I’m going through the same thing. It breaks my heart, to be honest. I was the youngest, and I stopped believing because of my older brother. 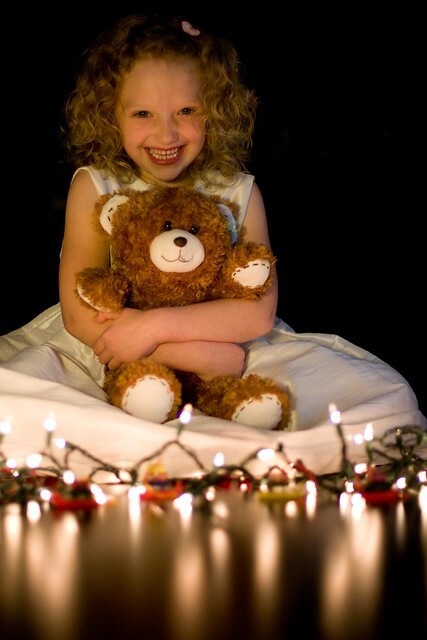 My daughter is an only child, but all of her friends at school have told her there is no Santa. I’ve told her that it’s hard to believe things that your friends don’t, but you have to start building your own belief system regardless of what other people say. I’ve pointed out that her friends belong to different religions, but she doesn’t tell them that they are wrong. But it pains me. This year she’s struggling to find a way that would prove to her once and for all that Santa was real, but I try telling her that there won’t always be a test to prove things. I’m struggling with how to deal with it. again with the trembling chin and eyes ever so slightly filled with tears. got me. xo. I love this, our oldest knows that Santa is actually Mom and Dad but she is holding out hope. I love her for that. I love the image of your Christmas, I hope my kids feel the same thing at our home Christmas morning!! My 10 year old still believes (so does the 6 year old)…but this will be his last year. As long as I can get them to…you better believe they will. And I will do whatever I can to keep magic alive as well..if they ask for ponies…..ponies will be at our front door Christmas morning. They are only young for so long…innocent and sweet. Our babies…monetary value..I don’t care what it costs……I want to see faces lit up. It makes me tear up thinking about it. What a beautiful post! I can relate. We just lost our last believer last week. She is ten and asked us straight out, so we had to tell her the truth. I’ve tried to emphasize with her (and her older brother and sister) that Santa represents the spirit and goodwill of the Christmas season, whch is very, very real. Both of mine still believe. Or they’re really good actors. We don’t go all out with it though. I strongly suspect that my 8YO has wisened up (thanks to some older classmates), but every time either kid asks me, my line is “Santa (like Jesus) is real to those that choose to believe in him. If you don’t believe, he won’t be there.” Needless to say, she’s on board with a a short, but hefty Christmas list this year. Even after I stopped believing in Santa, I always had at least one gift from the old guy under the tree. This is one of the best posts I’ve ever read. Seriously. I take Santa magic very seriously. It’s so pure, fun, and beautiful. I’m proud of you. I;m just slow clapping. yes to all of it! 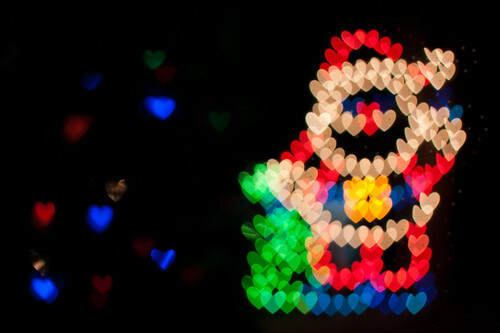 I love Christmas, always have. I love precisely the magic of it. There’s just something about the twinkle of the lights, the falling snow, the smell of the pine needles. There is just so much hope and promise in the air. And on some level I will always believe. Aww that was so sweet, my oldest is 7, I think I’ll keep up the Santa gig even when he doesn’t believe it anymore. Oh and we do the Elf thing, boy is it a lot more work that I thought. I may regret it a little.